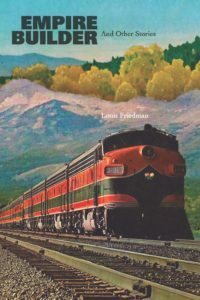 Empire Builder and other stories by Louis Friedman. ISBN 978-1-938928-04-8. $17.00. All efforts to provide marketing copy for this taut collection of razored stories caused the author to grimace and furrow his brow, so allergic is he to any hint of pretentiousness. These stories record various journeys undertaken by protagonists who sometimes know when they’ve arrived, but not always. Sometimes they travel with others, but often they are alone, with only the record of their journey to keep them company. Another furrowed brow has been detected. So, use the button below to learn the rest of the story . . . In Cincinnati, Ohio Empire Builder can be found at the Ohio Bookstore.